How about a challenge that makes you watch things that other people have rated? The club is big enough and it will surely be a wild ride. Good conversation starter to make a new friend so get out there and meet people! Must Do: for each difficulty you must watch 10 series that another user has rated going from 10 all the way to 1. Previously COMPLETED cannot be used. Start date is the day you post. Currently watching and airing cannot be used. » Music Type not allowed. » Series under 10 episodes must be 15+ minutes per. » Cannot overlap with the Hints Challenge or the HiScored Anime Challenge. Note | Number in list is the score given by the club member. Previously COMPLETED cannot be used. Rated 1 [✓] Himegoto Denci MY SCORE: 5 -> Fixed because user seems to have taken the rating of the previous series out since I watched it. Replaced with something I watched during the time I was doing this challenge. Rated 3 [✓] Tengen Toppa Gurren Lagann: Mitee Mono wa Miteen da!! 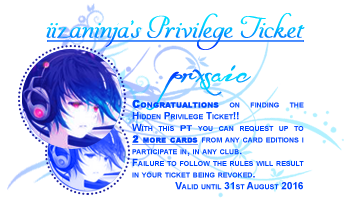 shiki-tohno MY SCORE: 4 -> Fixed because previous entry was wrong. Rated 3 [✓] I: Wish You Were Here Amitte_Sukku MY SCORE: 5 -> Fixed the user. I made mistake before. Rated 1 [X] Boku no Imouto wa "Osaka Okan"